Download this template as well as our other 19,624 templates for only $99! "Choose this really descriptive theme that is remarkable for its conciseness and clearness as it is designed mainly in light grey color with small green elements showing illumination in an operation room on the main background. Such a stunning template may look impressive for presentations on surgical operations, operation rooms' equipment, studying medicine and other topics related to surgery." Make your next PowerPoint or Keynote presentation more effective with our professionally designed Illumination Of The Operation Room template. Improve the way you present seminars, webinars and lectures. Make more exciting sales presentations, trade show displays and product promotions, or use them in any educational setting for more impact and greater retention. Illumination Of The Operation Room presentation template includes built-in layouts and stunning backgrounds to make your presentation a winner. The attention we pay to the finest detail make this presentation template truly world-class. We take pride in employing features most companies skip because it's "too much work." This Illumination Of The Operation Room presentation theme is carefully considered and implemented to maximize the beauty, consistency, clarity and -- most importantly -- audience impact of your presentation. 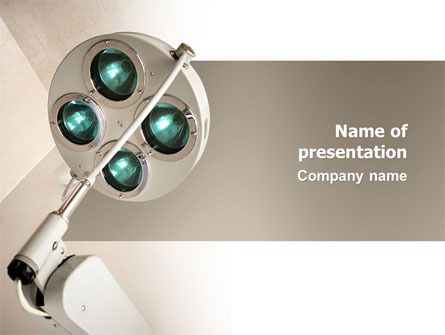 Making Presentations Just Got a Whole Lot Easier. Illumination Of The Operation Room template for presentation is laid out in a way that simplifies the complexities you may have previously encountered with Keynote or PowerPoint. It is easy to follow, and it comes with all the design features you need built right in. Just type in your text on each page and that's it! We fuse your message with world-class design to create dynamic, audience-engaging presentations. Visual Credibility. In addition to your text, your imagery also sends a message. We'll help you send the right one. Your amazing ideas need amazing visuals to provide consistency and credibility. With Illumination Of The Operation Room presentation template, you are well on your way to making the kind of impression you want to make.